Not all gyms are created equal! A GUIDE ON HOW TO CHOOSE A CROSSFIT THAT'S RIGHT FOR YOU! We are often asked by those new to CrossFit, curious suburbanites and even a few old pros about what they should look for in a CrossFit gym. Many think that since the word “CrossFit” is on the sign, that all CrossFits are alike. However, right, wrong or indifferent, CrossFit affiliates are given quite a bit of latitude in how they run their operations. From facilities to coaching credentials to programming (ie designing the daily workout) to community to pricing… there are a lot of variables that come into play when determining where you are going to invest your time, your energy, your well being and your money. If you are considering Daybreak as one of your fitness options, here’s a simple checklist of 12 key considerations (and #12 is wildly important) to help you make the right choice for you and your family… and no matter where you end up CrossFitting, Daybreak welcomes you to the CrossFit family! (1) How good is the website? It may sound silly, but the quality of a website is a reflection of the time and care put into the gym. Is the layout intuitive and is the content up to date? Are there typos and grammatical errors? Are photos clear and professional looking? Do you see more photos of coaches and owners than you do members (um… warning sign!). Can you quickly find key information: What is CrossFit? What values do the owners espouse? Do they have a wide range of reviews across various media (e.g. Facebook, Yelp!, Google)? Do their members post and interact on their daily workouts or is it void of community? While a website is no substitute for visiting the gym in person, it’s certainly a warning sign if not done properly. (2) Are the coaches experienced and well-credentialed? At a minimum, make sure all coaches are Level 1 Certified trainers in CrossFit and have several years under their belt. Even better — they have multiple certifications across CrossFit domains, such a Olympic weightlifting, gymnastics, mobility, endurance, mobility among others. This is a sign that the gym invests in ongoing education for its coaches. Best case — they have Level 2 and Level 3 certifications, which can only be gained by having time in the saddle and going through more rigorous testing and training. Daybreak is the only area CrossFit with both Level 2 and Level 3 coaches on staff and one of the few who are recognized by Reebok for our commitment to and track record of quality coaching/programming and athlete safety. (3) Would you do a burpee on that floor? CrossFit gyms are sweaty, chalky, and on rare occasions bloody places. 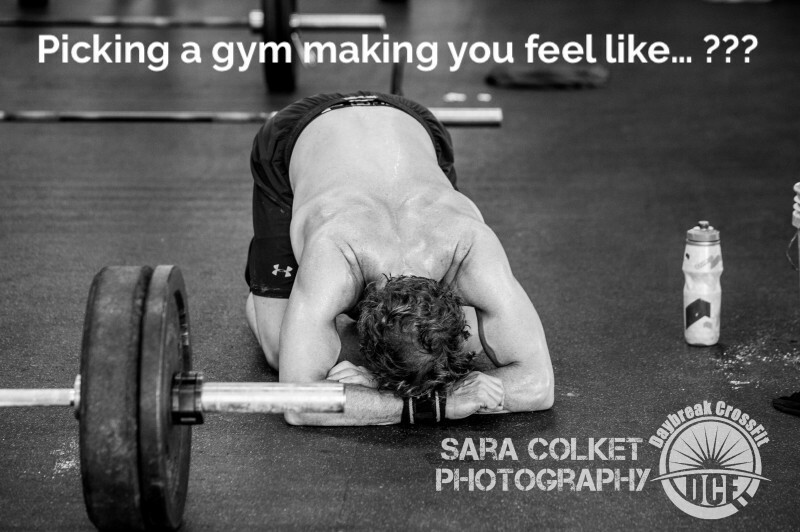 Hands sometimes tear, bodies perspire, athletes cry (tears of joy, of course) and like any other gym, much of that goes onto equipment and floors. Ask if the gym is professionally cleaned. Ask how many times per week. Do they have antibacterial wipes on hand? Do they instruct (better yet, demand) that members wipe down equipment after use? Are the bathrooms, showers and locker rooms clean and garbage-free? A well-organized, clean CrossFit gym shows that the owners and coaches take pride in their facility and strive to deliver a quality service. Daybreak is professionally cleaned and disinfected a minimum of 3 times per week. (4) Are they running Groupons or offering Punch Cards? Search the web for the CrossFit in question and see if any Groupons or other social media deals pop up on the first or second search results page. Also look at their programs and pricing page for “Punch Cards” or “Class Passes”. This is a likely sign that your CrossFit is filling classes with transient discount seekers who often crowd classes, monopolize the coaches’ attention and then after the deal expires, jump ship to the next best discounted gym. Also be careful of gyms who offer punch cards. We have found that it’s a surefire way of filling classes with members who aren’t around enough to help fortify and build the community. Not to mention, the very nature of a punch card is conducive to less frequent visits that result in coaches having to spend a disproportional amount of time teaching, training and guiding these “half-in” members. We’ve seen both of these pricing tactics backfire on many gyms and we refuse to compromise the experiences of our dedicated and loyal members. (5) How often do they host external competitions? Does the gym host frequent competitions? Do they take away a valuable training weekend from their members while they’re hosting the competition… or even worse, do they charge their members to attend the competition? While Daybreak is a fan of competing and getting our members to participate in local contests, we choose not to host competitions at our facility because it takes a weekend away from our members… a weekend for which they paid. It also puts significant wear and tear on equipment and facilities, which could degrade the experience of members. (6) Do the classes represent all levels of fitness? Try to observe, or better yet, experience a class in person. Who is in class next to you? If you’re unfamiliar with CrossFit or just getting started, you should look for gyms where members come in all shapes and sizes, young and old, limber and perhaps having some physical limitation such as a bad knee, back, shoulder, etc. Do you see coaches modifying workouts individually for their members’ needs? Or does it appear to be a one size fits all class where everyone fends for themselves? Does the gym integrate advanced members with those who are new without creating “class warfare” within the box? While competitive programming and advanced classes have their place, we think gyms who choose to integrate (vs. separate) their community and fitness levels are usually the ones delivering a more inclusive, supportive, non-judgmental and drama-free environment. (7) Do they offer nutritional counseling and support? CrossFit in the gym without proper nutrition habits outside the gym is not likely to yield any results! Most CrossFit gyms will (and should) offer some level of nutritional guidance for their members. However, we suggest looking for coaches/owners with credentials in nutrition. If you are serious about leaning out, living healthier and improving your performance, then look for a gym that provides more than the occasional “Paleo” recipe on their forum or website. (8) Do the owners have 'skin' in the game'? A CrossFit with an absent owner is often one that fails to deliver on the promise of CrossFit. Ask if the owners coach, visit or even take classes in their own gym. Are they on site very often? Do they make themselves available to members and their questions? Daybreak is owned and operated by a Sudbury family and because we live here, work here and play here… we have a vested interest in making our gym and our town better. And we’re always supporting/sponsoring local causes such as the McCrae Williams Foundation, Scott Milley Memorial Fund, HOPEsudbury, Loring PTO Fun Run, Sudbury Parks & Rec Halloween 5K, Sudbury for Wounded Warriors, among others. (9) Is the price too good to be true? While a price may look good on a website or as part of a longer term contract, make sure you understand why. Are there hidden costs? Do they charge you for routine clinics such as rowing, mobility, or others? Do they charge you for that competition (see #5) they’ve scheduled over that weekend class you’ve already paid for? Do they make you buy your own athletic tape, wraps and other accessories? Do they cater any social gatherings for their members? Do you have to bring your own toiletries and shower essentials? Make sure you’re taking into account all costs instead of simply comparing monthly fees. At the end of the day, you have to ask yourself, is my box focusing on QUANTITY of member or QUALITY of member? (10) Does the gym create its own workouts? May sound like a funny question, but some gyms choose to follow another gym’s workout program. While that program may serve the originator’s gym well, it’s not likely going to cater to the unique make-up of the gym following it. CrossFit gyms are are as different as the members in it. So, look for gyms where owners take the time to create thoughtful workouts that meet the needs of their members and don’t compromise by simply taking a one-size-fits-all approach. Another question to ask is whether the owners workout with the members! (11) Are the social reviews genuine? It’s important the user reviews on Google, Facebook and Yelp are authentic and unsolicited. Watch out for “batches” of reviews that are all left in the same month or over a short period of time. Instead, you should see a steady and preferably widely distributed range of reviews throughout the CrossFit’s business life. (12) What is their Community like? Community is one of the most important aspects of a CrossFit gym. And it’s one of the main reasons it works so well. Look for a gym that has its own active community which socializes before and after workouts. But make sure it is open and inclusive. Do you see evidence of cliques or do coaches favorite just their ‘competitive’ athletes? Does the gym host (or better yet subsidize – see #9) community-building events like socials, dinners and/or fundraisers? Do they invite members to attend clinics, workshops and maybe even off-site competitions? Do you see family members participating… husbands and wives… partners… parents and children? If you see family… then you see community. If you see community… well, then you you’ve probably found your new fitness home.